History isn’t the only thing seeping from the walls at the Newes from America Pub in Edgartown. But the year-round restaurant is far from drafty. In fact, it’s probably one of the coziest spots on-Island. The walls are painted dark, the wooden floors are almost black. The interior brick and stone walls and overhead pipes give the place its feeling of total timelessness — like you could be dining in the 1800s. It’s dimly lit, and the soft jazzy soundtrack accompanies the mood like sound therapy. A large indoor fireplace is a centerpiece for winter regulars. 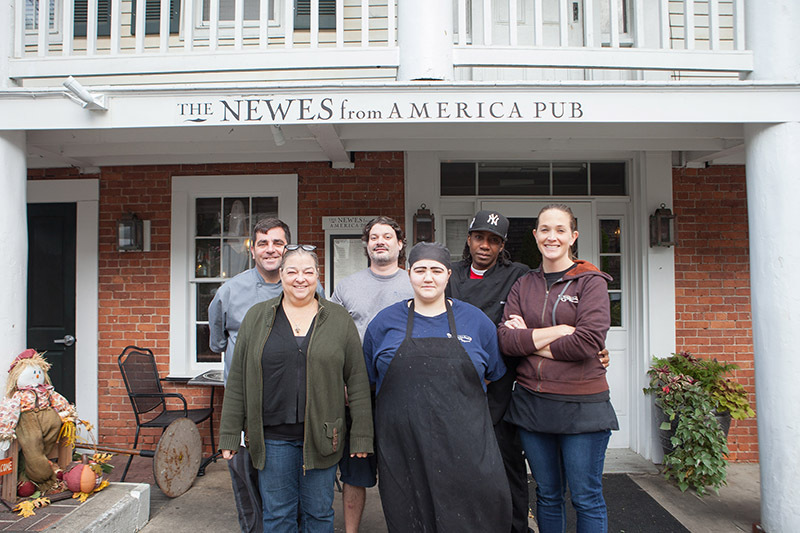 The Newes from America Pub is part of Kelley House, which is the oldest hotel on Martha’s Vineyard. The Newes opened in 1992, although Kelley House has occupied that space since it was first established in 1742. When you get 500 wooden nickels, your name goes up on the Declaration of Distinction board, and with 1,000 nickels, your names goes on the Declaration of Superiority Board. There are two large boards that look like giant framed Declarations of Independence, listing the names of these wooden nickel extraordinaires. “People get really into it,” Ms. Joubert said. History is embedded in everything, and the colorful custom-painted downtown Edgartown murals are striking against the dark simplicity of the dining room. It’s hard not to inquire about lingering spirits when you’re dining in a building that’s been around since the early 18th century. Ms. Joubert said people keep coming back to the Newes because it’s cozy, and everybody knows everybody. Their staff is made up of the same year-round crowd that’s been there for years. 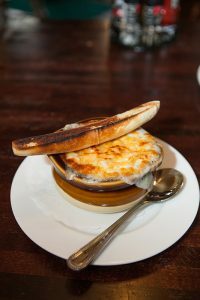 The French Onion Soup with 3 Cheeses ($10) is one of the popular menu items. It takes three days to make, and is served with garlic bread. Now that it’s winter, the Newes is kicking off the season with daily specials: Meatloaf Mondays, shrimp and grits Tuesdays, chicken pot pie Wednesdays, beef and bean burrito Thursdays, and fishermen stew Fridays. According to Ms. Joubert, The Newes’ original owners were Englishmen, and the building’s interior beams reminded them of old English pubs. Newspaper spindles used to hang on the walls, and people would sit around and read them all day. The owners wanted to keep the spelling of “newes” in its traditional English format, and thus became the Newes from America. 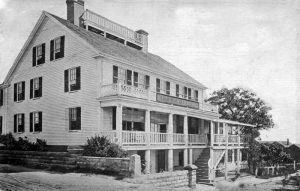 The Kelley House circa 1890. Being at the Newes solves all winter problems because it’s like being warm and cozy under a blanket while still being out. “You have to learn how to light a fire if you work here, it’s part of the training,” Ms. Joubert laughed. Elizabeth Rothwell is Kelley House’s director of marketing and special events. She said Ms. Joubert is the reason why everything at the Newes works so seamlessly. The Newes from America is open seven days a week from 11:30 am to 10 pm. For more information, visit kelley-house.com.